Planks are a great abdominal exercise if done correctly. They target more of the lower abdominals and the stabilizing muscles of the trunk than a traditional abdominal crunch. 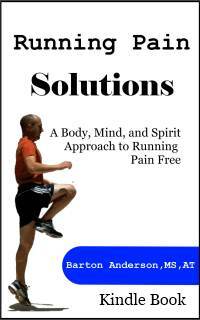 I use this exercise with my patients all the time as part of an ab training program and their sports injury rehab. The only way to get this exercise to effectively work the core is to make sure that your alignment is perfect. You should try this exercise in front of a mirror or with a partner to start off until you get your position perfect. You will know if you are doing it right, because you will feel it in your abs. For perfect alignment, you should make sure you create a straight line from your shoulders to your heels, especially through your trunk. If you sag your hips, you will feel this in your low back. And if your hips are too high, you will feel your shoulders working more than your abs. Once you get into position, hold for 15-20 seconds or until you feel your abdominals starting to burn. Relax, and then repeat. 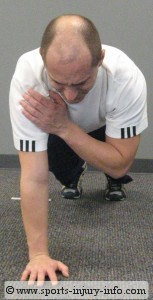 The elbow position, as shown above, is the basic exercise. There are lots of variations you can do. 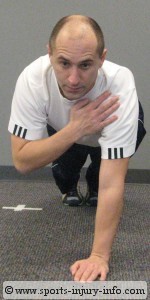 One simple one is to move from your elbows to your hands...this is a push up position, but instead of doing a push up, you simply hold the position. You can also add movement. This will challenge your abs even more, and improve your core stability. 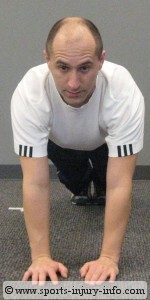 From this position on your hands, draw in your abdominals and then lift your right hand to touch your left shoulder. Try not to let your body move or sway. Return to the starting position and then reach your left hand to your right shoulder. Return and repeat. Practice in front of a mirror to monitor your alignment and make sure you don't sway back and forth. Abdominal planks are a great core exercise. Make sure that you keep your alignment throughout the exercise. As the elbow plank becomes easier, increase your holding time, or move to the more difficult shoulder tap.